Floor Standing Oil Rubbed Bronze Griffith Astro Telescope 50"
Floor Standing Brushed Nickel Griffith Astro Telescope 50"
Floor Standing Bronzed With Leather Griffith Astro Telescope 50"
Floor Standing Antique Copper With White Leather Griffith Astro Telescope 50"
Floor Standing Antique Brass Griffith Astro Telescope 50"
Floor Standing Antique Copper With Leather Griffith Astro Telescope 50"
Floor Standing Oil-Rubbed Bronze-White Leather with Black Stand Griffith Astro Telescope 50"
The Hampton NauticalOil Rubbed Bronze/ White Leather Griffith Astro Telescope 50" with view finder is a beautiful refractor telescope mounted on a wooden tripod. 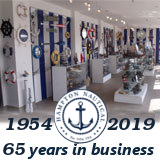 This telescope is a fully functioning nautical masterpiece that can be given as a gift, or placed in your home, office or boat as beautiful nautical decor. The main scope is oil rubbed bronze with a smooth, finished wood handle, and both scopes provide up to 12x magnification. Focusing is accomplished by adjusting the eyepiece ring on the telescope tube. A removable bronze cap, connected by a chain, protects the objective lens when not in use. The wooden tripod stand features smooth, polished round legs, each with solid bronze fittings and a screw release to let you adjust the height. 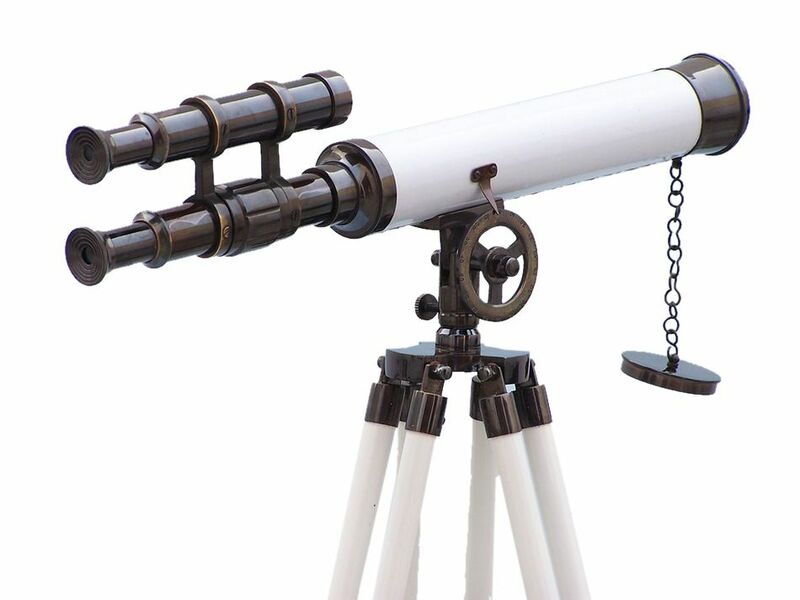 A solid bronze chain holds the three wooden legs together so the telescope can maintain its position.